On February 17, at 11 am, The Federal Reserve Bank of New York will release the Household Debt and Credit Report for Q4 in conjunction with the release detailing the state of student loan delinquencies. This report contains invaluable information about the state of the country's debt levels. Last quarter, the third quarter of 2014, total household indebtedness was $11.71 trillion, up 0.7 percent from Q2. 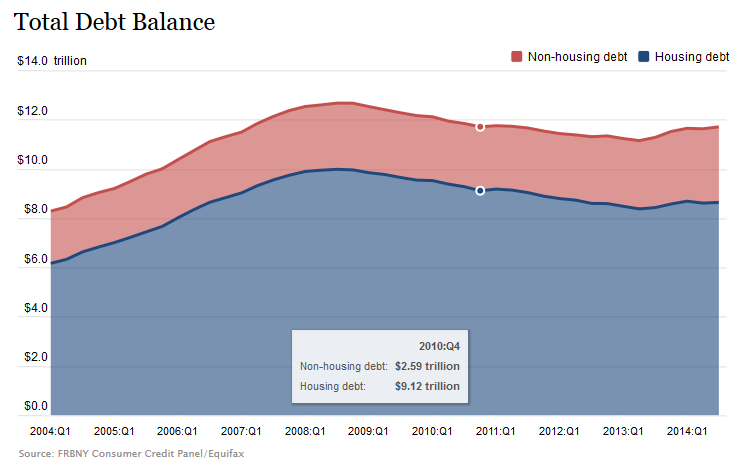 Overall household debt remained below 2008 peak levels of $12.68 trillion. Here's a link to last quarter's report. You can request your own copy of the report from Kevin Sajdak at kevin.sajdak@ny.frb.org.